I’m a bit confused on the best way to enter items into this app. There are fields for name, details and comments. What should be entered into each? Should name be the generic name for an item, or the brand name? Should details be the brand name for an item, or it’s size? Should comments be the size of an item, or the generic name? I want to be consistent, and enter the generic item name (bread, toothpaste, sliced cheese, etc.) such that if I enter the generic item, in the drop-down window I can then choose which of my preferred brands I’m buying during that particular shopping trip. Make sense? What is the best way to accomplish this? And why are there two entry fields when you are adding an item from scratch? Thanks! Keisha, the way you enter data in the app is totally up to you. 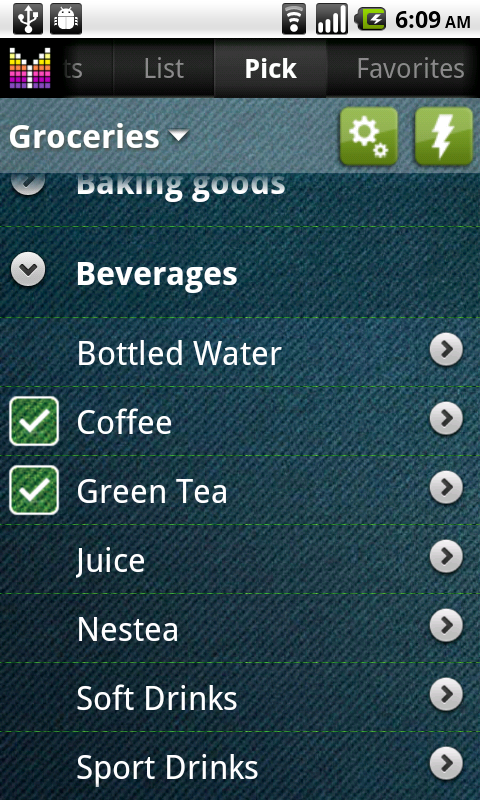 I recommend entering a few items and simulate your shopping trip in order to see how the app works for you. Most likely you may want to put brand and item name in Name/Details fields and also use Generic name field as you suggested. Unfortunately, there is no popup window with brand options to choose from, but generic name can be used for price comparison. We will also consider using generic names as you suggested. Not sure what you mean about the two entry fields. Could you please provide more details? Hello. I’ve been using MG for several years now and recently migrated to a new phone. The migration was successful and all my history, items and lists are available. However, I’m having trouble adding items to my lists. When I add an item to a list using the plus mark to search the list, the keyboard covers the items I’m unable to select them. I can scroll through the list but cannot use text search. Hi Julie, please try rebooting your phone. If this does not help this may be caused by the keyboard app you are using. Try switching to stock keyboard app and see if this helps. If this does not help, please send a screenshot of the problem to hi@mightypocket.com so we could have a closer look. Thank you for your patience. I just want to add to the list of users wanting Pick List be synced. We have 3 copies of MG and it is very frustrating as we also use the main account on a tablet and then shop with our smart phones. So when our main account has the proper names and prices for all the items it does no good when we are in the store not to be able to add it to our cart. Wish I’d known this before buying. I will try the work around you mentioned above but just reading it, it doesn’t sound as if it will work well. Just cause more work & we bought these to avoid all the work of a calculator etc. Also there is no decimal point on mine either like Jim above. I look forward to trying out that tip. However my husbands does have the decimal point so maybe I just need to update. Thanks for the cool app!!! Bethany, thanks for your feedback and sorry for the inconvenience. We are working hard to allow Pick list syncing in one of the upcoming updates. As for decimal point, just use any non-digit symbol and it should work just fine. Thank you for your patience and understanding. Just got this App for my wife and myself and we love it so far. I have been going through the user’s guide trying to learn all the features. From what I’ve determined so far, the (Pick List) is a repository that contains general product information that can be shared with the other lists. Quantity and price information is specific to the individual store lists and not useful when updated in the general (Pick List) each time a store list is updated. I went into advanced settings and turned off the Automatic Picks option, so that changes to the store lists are not pushed to the Pick List, but that did not seem to work. When I add an item to say Store A’s list and update the Qty to 3, I don’t want the Qty for that item to be set to Qty 3 each time I add that item to a store list. Is there a way to make this happen? I’m I overlooking the obvious? Any help would be greatly appreciated. Thanks for your question. Kindly note that in order to prevent propagation of price, qty and other attributes to Pick list just do the following: under Edit Product tab click the link button (upper-left corner) and choose Unlink. Unfortunately, you’ll have to do this individually for each product. We may consider adding an option to prevent propagation of attributes app-wide. Please let me know if you have any further questions or comments. Thank you for the quick response. The unlink option was just what I was looking for. I manually unlinked all the items in my Pick List so I can focus on updating Qty and price information on the individual Store Lists. Is there a way to change the default to “unlink” for new items going forward, or do I have to make it a point of remembering to unlink new items as I add them? Unfortunately, there is no option to make unlinked items by default. We may consider this option going forward, but for now it will require to remember unlinking the items. Terrific application! I have several comments about the heuristics of the voice search and match engine. The voice search capability really sets you apart from the competitors, and I consider it the single most important feature of the UI. 1) I would like a phrase of 2 or more words matched in any order in the Pick List item name. A voice search for “Green Beans Frozen”, “Frozen Green Beans”, and “Beans Green Frozen” should yield the same Pick List item, but these seem to be treated as entirely different requests. I should not have to remember the word order in the Pick List in my old age. 2) The text of a voice search may partially match one or more possible entries in the database. The engine should offer a list of possible matches from which to choose; or if only a single match, the complete text of that database entry. For instance, my Pick List has “Ginger Ground”, “Ginger Fresh” and “Ginger Bulk Ground”, which are located in different aisles and may have different units of measure. If I voice search only “Ginger”, the engine will choose one of the entries (which one??) and add “Ginger” to the list without the full text of the database name. 3) When the text of a voice search isn’t in the database, it is automatically added to the shopping list as-is, regardless if it is correct or not, without any user control or indication if the item was found in the database (as far as I can tell). The speech to text is often wrong! If there is no match, you should have a prompt to add the item, voice search again, manually search the Pick List, or Cancel. 4) A Pick List item comment or detail doesn’t seem to be included in the voice search. These fields can be important when using the fields for child categories of a parent item. Hi Jim, thanks a lot for your feedback! Regarding #3 I’d recommend setting “Auto confirm voice” options to OFF. It’s available under Menu > Settings > Options > Advanced. As for the other suggestions, we may consider implementing this going forward. Thanks a lot for your input! I agree with Jim completely. Voice search could be an extremely useful tool if it behaved as Jim mentioned above. As it is implimented now I never use it because, as Jim mentioned, my voice search rarely matches the items in my extensive pick list. Jim’s suggestions (#1 and #2) would make a huge difference and change the voice search from a feature I never use to a feature I couldn’t live without. Thank you for a great app! John, thanks for supporting the voice feature improvements! Is the pick list supposed to sync between multiple users? My wife and I have bought Mighty Grocery. She has carefully recorded pick lists with the names of the products we buy, prices, and the aisles they are in etc. 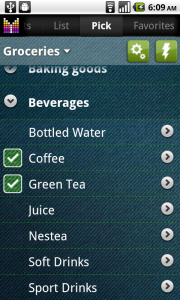 I have setup my phone to use the same account and I can see her shopping list for the next visit to the supermarket. But if I go to add an item, it only lists the default items plus a small number of the ones she has created. This frustrates my wife because then I just add the item as a new entry, duplicating her one but without all the proper details. Once she fixes that, I think it then appears in my pick list – too late! Brenton, thank you for your feedback. I apologize for the inconvenience with the Pick list. We plan to allow syncing Pick lists between phones going forward. In the meantime, you may want to try the following workaround: Create a shopping list named “Pick list” and share it between your phones. Then your wife would make changes to that list and changes will automatically sync with your phone and will automatically be added to Pick list on your phone. Hopefully this helps. ok so I have about 7 different stores I shop at and each store has there own items the way I shop is I make a “base” list with everything I would be interested in buying and then each month when I do my shopping I pick specific items from each store for my “shopping list” I cannot for the life of me figure out how to have multiple SEPERATE “pick lists” that keep their info seperate from eachother it keeps getting mixed no matter what i try….HELP!!!! Melissa, thank you for your question. I recommend you trying the List-specific Favorites feature which allows creating per-store lists of items with store-specific details. Hopefully this helps. Sorry for the inconvenience. The next update should fix this problem for your handset. We are currently testing the new update and you could join our Beta testing group in order to give it a try. This is a great app and I just began using it yesterday. I particularly like that I can customize aisles for individual stores. In fact I can find no fault except one with the functions that I’ve learned to use so far. I would lke to see 1 change in the numbers keypad and that would be to add a decimal point on the main keypad rather than on the symbols screen. It’s inconvenient to have to use two screens for each price item entry. Otherwise, no complaints. Jim, thanks a lot for your feedback! Kindly note that you can use any non-digit symbol from numeric keypad as decimal separator. Please let me know if you have any further questions or comments. We have been using Mighty Grocery Full version for a couple of years and love it! Trouble is, we create the list on our Kindle Fire but do the shopping with an Android smartphone. Consequently, any in-store updates to items do not get synchronized with the Kindle pick list. On July, 11 2011 there was a comment by Alex that syncing the Pick List to cloud was being considered for the future. Since it is now the future, is this change closer to release? Version 2.2 maybe? I’ve tried the experimental export -> import process, and it worked, but it is so intensively manual that I don’t want to have o do it again! Dan, thank you for your question. Pick list sync is planned, but most likely it will take a little bit longer than version 2.2. Thanks for your patience and sorry for keeping you waiting.